The Vermont House voted 137 to 1 last May to close a loophole that, for years, had allowed legislators to hit up registered lobbyists for campaign cash during the legislative session. Though legislators were already barred from raising such money for their personal campaign accounts until the end of the biennium, they had long skirted the rule by doing so through so-called leadership political action committees. Those PACs would invite lobbyists to mid-session fundraisers — featuring legislative leaders — and then direct the proceeds to legislators' reelection campaigns. Last year's law banned the practice. But as former U.S. Supreme Court justices John Paul Stevens and Sandra Day O'Connor once wrote, "Money, like water, will always find an outlet." Last month, according to Vermont Democratic Party executive director Conor Casey, the House Democratic leadership PAC was dissolved, and its sole staff member, Katherine Levasseur, was absorbed by the state party. Levasseur is still working to elect House Democrats, but because she now reports to the party, which was not affected by last year's law, her salary can once again be paid with lobbyist contributions. According to an invitation obtained by Seven Days, the same legislative leaders who used to headline mid-session fundraisers for their leadership PAC will on Thursday night serve as featured guests at a Montpelier fundraiser for the VDP. Three registered lobbyists told Seven Days they were invited to the event, and Casey confirmed that 15 lobbyists had RSVPed. 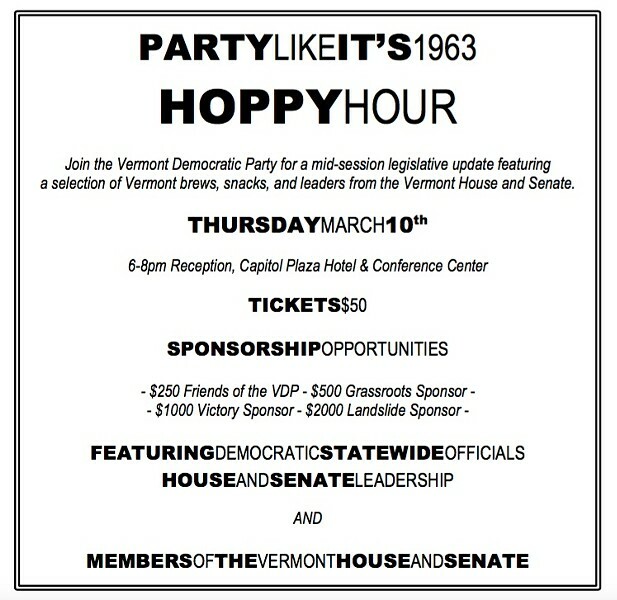 The invitation bills the fundraiser, which will take place at the Capitol Plaza Hotel & Conference Center, as a "mid-session legislative update featuring Vermont brews, snacks and leaders from the Vermont House and Senate." According to Casey, either House Speaker Shap Smith (D-Morristown) or Majority Leader Sarah Copeland Hanzas (D-Bradford) will address the donors. Reps. Kurt Wright (R-Burlington) and Patti Komline (R-Dorset), who authored the bill closing the loophole, say they are dismayed that House Democratic leaders are continuing to hit up lobbyists during the session. "It appears pretty obvious to me that they have not abided by the spirit of the law and found a way to continue, during the session, to rake in money from lobbyists — and I think that's very disappointing," Wright says. "This is clearly a shakedown of lobbyists. It looks like pay-to-play," Komline says. "It's unseemly that people in this building would be asking lobbyists for money during the session." Precisely why House Democrats shut down their leadership PAC and transferred its electoral efforts to the party isn't quite clear. "We can't fundraise into it, so we don't need it anymore," Copeland Hanzas explains. Speaker Smith has a different explanation. He says that, since 2014 lieutenant gubernatorial candidate Dean Corren faced legal scrutiny last spring over coordinating campaign efforts with the VDP, Democrats have been taking a closer look at their procedures to ensure compliance with the law. Casey, who took over as VDP executive director last summer, echoes that view. "It was a priority of mine when I took the job, being cognizant of some of the stricter campaign finance laws," he says of the structural shift. "It was just cleaner." But Casey makes no bones about the fact that his organization has "always been able to accept lobbyist money." He says the VDP needs it. "I mean, we're constantly holding fundraisers for the party. My job is to get people elected up and down the ticket," he says. "As I'm looking at the influx of independent expenditures coming from out of state, I know the party needs to be strong and able to defend our candidates at every level." That House Democrats found a way to fund their reelection efforts through lobbyist contributions, even after voting to ban the practice, shouldn't come as a surprise. Speaking last May after passage of the Wright-Komline amendment, Smith himself predicted it. "I think that the amendment is nothing more than a feel-good amendment that doesn't get money out of politics," he said then. "I know that people tend to be creative, and they will probably find other ways to secure money to support candidates."